A tweet from @runnersworld on Nov. 29, 2011 caught my attention. "Q: What, exactly, do high-intensity intervals do for your heart that moderate running doesn't? A: http://ow.ly/7IO1S". I did several 800M repeat workouts this past fall preparing for the Quad Cities Marathon, so I was curious enough to click, but then disappointed to read a superficial paragraph that failed on its promise of exact answers. According to the link, two groups of mice worked out on a treadmill, one on a moderate-intensity training (MIT) plan, while the other was put through high-intensity interval training (HIT) runs. After 10 weeks, the HIT group gained significantly in measures of heart efficiency, while the MIT group did not. I was intrigued, but needed more info. What do they mean by "significantly" and what are their "measures of heart efficiency", anyway? What are the data behind these statements? by Anne D. Hafstad et al. Looking at the abstract, I realized this must be the primary literature article on which the Runner's World tweet was based. My daughter calls me a 'running geek' and after you read the next sentence, you'll know why. I clipped the article into my 'Cool Running' Evernote Notebook for later reading, which I did the next weekend. I found the article to be detailed and interesting - interesting enough to write it up in this post. Figure 1. Substrate utilization data. The abstract indicated that high intensity interval training, but not moderate intensity training "altered cardiac substrate utilization, as revealed by a 36% increase in glucose oxidation and a concomitant reduction in fatty acid oxidation." The data are shown in Figure 1 where SED is a control group of age-matched sedentary mice. The * signifies a statistically significant difference relative to the comparison group. Beyond that, the graphs are pretty much self-explanatory. Study them for yourself. From the article's Methods Section I learned that these data came from experiments performed on isolated, functioning hearts extracted from mice having completed their 10-week training stints. Figure 2. Mouseover sends to MarvinSketch. 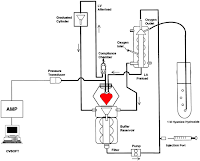 To collect the substrate utilization data, the isolated hearts were fueled with two radiolabeled substrates: glucose, to determine the energy derived from glycolysis, and palmitic acid, to determine the energy derived from fatty acid oxidation. I wondered how these experiments were performed so I linked to a cited reference which described how cardiac substrate usage was quantified. Different isotopic labels were used for the different substrates: carbon-14 was used to mark glucose while palmitic acid was tagged with tritium (Figure 2). Figure 3. Heart perfusion apparatus. The data in Figure 1 came from measuring 14CO2 and 3H2O, the metabolic byproducts expelled from the working hearts. The quantity of each radioisotope indicated how much energy was derived from glucose vs. palmitate. 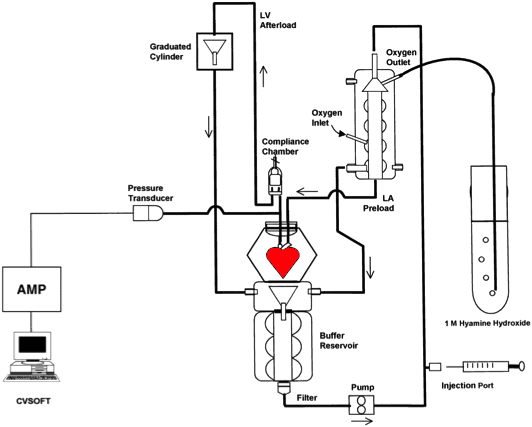 Figure 3 shows a cool schematic of the apparatus used to determine substrate utilization in the isolated, working hearts from mice that underwent endurance training. These findings were corroborated with cellular-level responses. 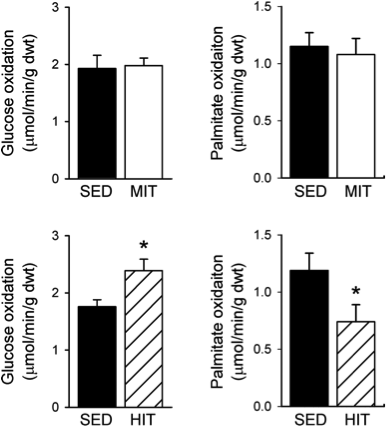 Specifically, measures of citrate synthase (CS) activity, mitochondrial respiration and gene expression revealed important differences in mice subjected to HIT relative to those receiving MIT. Only HIT was found to increase myocardial CS activity. Moreover, upregulation of cardiac gene (mRNA) expression of lactate dehydrogenase (ldh), hexokinase (hk), and vascular endothelial growth factor (vegf) followed HIT (see data); MIT did not increase the expression of these genes. 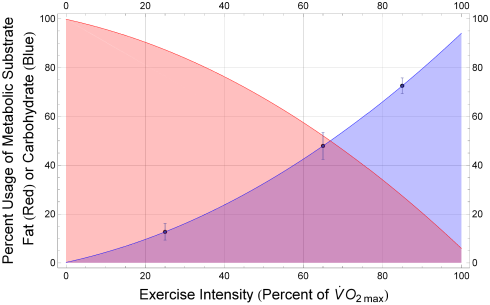 The authors conclude that exercise needs to be of high intensity to activate the intracellular pathways responsible for cardiac muscle adaptations that meet the heart's energy demands during high workloads. They also made an interesting comparison between myocardial and skeletal muscle. Whereas moderate and high intensity interval training both induce mitochondrial biogenesis in skeletal muscle, the myocardium does not respond as easily. In the author's words, the myocardium exhibits less metabolic plasticity than skeletal muscle. Pretty cool. I'll try to keep that in mind the next time I hit the track to do interval runs. Figure 4. Metabolic substrate depends on exercise intensity. Next, I wondered why glucose is the substrate of choice under a demanding workload. The article didn't explain this. Was I expected to know this? Or, was it a conclusion that the authors didn't want to make? I decided to do my own thinking. I recalled a figure from an article I read sometime ago which showed the crossover from fat-to-carb burn as a function of exercise exertion. I found the figure in my 'Cool Running' Evernote Notebook which I've reproduced as Figure 4. The article from which this figure was obtained was even more helpful. It said that when oxygen is in short supply (i.e., hypoxia), as it would be during HIT, simple calculations reveal the greater efficiency of carbohydrate vs. fatty acid fuels. For example, a reaction typical of cellular respiration involves the complete oxidation of glucose: C6H12O6 + 6O2 → 6CO2 + H2O, consuming 6 moles of oxygen per mole of carbohydrate, liberating energy at a density of approximately 4 kcal per gram carbohydrate. Since glucose has a molar mass of 180 g/mol, carbohydrate oxidation typically generates approximately 120 kcal per mole of respired oxygen [i.e., (4 kcal/g x 180 g/mol)÷6 molO2 /molcarb =120 kcal per mol of respired O2]. On the other hand, a reaction typical of fatty acid oxidation is that of palmitic acid: C16H32O2 + 23O2 → 16CO2 + 16H2O, which consumes 23 moles of oxygen per mole of fatty acid, and liberates energy at a density of approximately 9 kcal/g fatty acid. Since palmitic acid has a molar mass of 256 g/mol, typical fatty acid oxidation generates only approximately 100 kcal per mole of respired oxygen [i.e., (9 kcal/g x 256 g/mol)÷23 molO2 /molfat =100 kcal per mol of respired O2]. Working through the numbers makes clear the significantly greater efficiency of burning carbohydrates relative to fat for aerobic metabolism under conditions where oxygen is limited in its supply. Figure 5. Endurance training for mice. I now have better understanding of the metabolic and mechanoenergetic gains that accompany the discomfort of interval training. While I'm no expert in the topics covered in this post, I hope you see this foray as an example of learning in the wild. That's what we do in this blog. Before leaving the topic, I wanted to share two interesting, but somewhat random nuggets I discovered while researching this post. 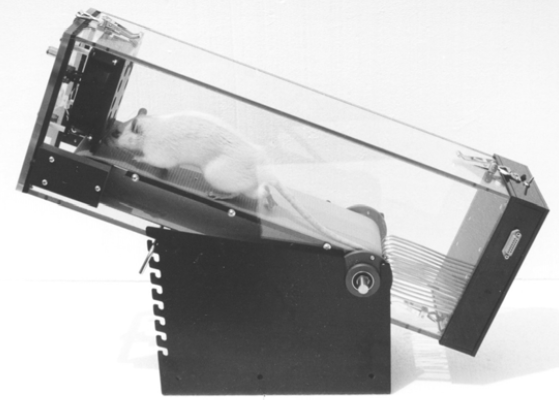 First, check out the treadmill used to train the mice (Figure 5). Curiosity got the best of me when I read "Modular Treadmill, Columbus Instruments" in the methods section of the article. A Google search on those words provided all the detail I wanted. Notice the 'stimulus assembly' near the mouse's tail. Adjustable shock intensity is not an option I want on my treadmill! Second, the molecular machine known as Complex I performs the first step in respiratory electron transport - the process that creates much of the energy that powers our cells. Complex I is the December 2011 Molecule of the Month on the Protein Data Bank pages. Mouse over the Jmol icon on the image below to obtain an interactive view of this fascinating, membrane-bound protein. 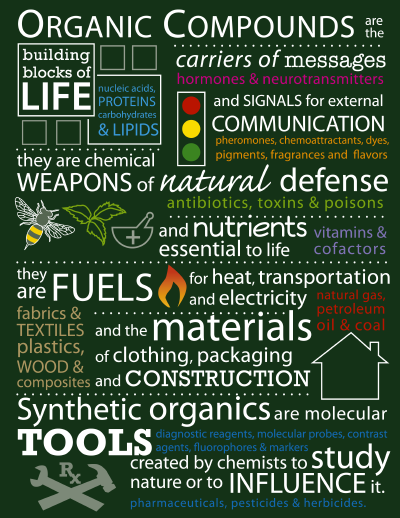 The schematic diagram below summarizes the important concepts mentioned in this post. Complete details of the metabolic reactions are available by mousing over a MarvinSketch or Jmol icon in the image. For additional information, please consult the list of resources at the bottom of this post. Schematic diagram of cardiomyocyte metabolism showing an enlarged view of a mitochondrion. Glucose and fatty acid metabolic pathways are highlighted in yellow and blue, respectively. Mouse over an icon to send an image to Applet. Adapted from J. Clin. Invest. 2005, 115, 547–555 doi:10.1172/JCI24405. For an insightful review on cardiac energy metabolic pathways, check out J. Clin. Invest. 2005, 115, 547–555 doi:10.1172/JCI24405. The pyruvate dehydrogenase complex (PDH). 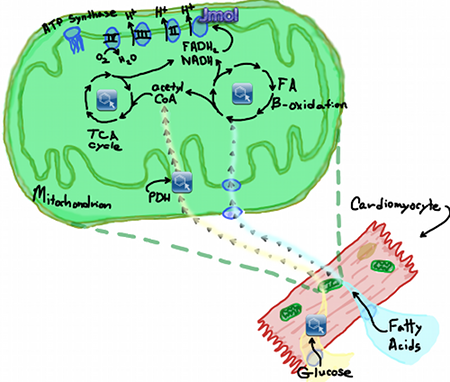 KEGG pathway of fatty acid metabolism. KEGG pathway of the TCA cycle. KEGG map of oxidative phosphorylation. For details on the nomenclature of isotopically modified organic compounds see: Eur. J. Biochem. 1978 86, 9-25.